It has been a fascinating and unparalleled journey. For 15 years because of the Miss Haiti pageant many young Haitian women got intimately connected to their Haitian roots. 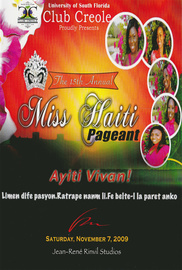 The University of South Florida Club Creole 15th Annual Miss Haiti Pageant 2009 reaches a milestone. 15 years. It has been a fascinating and unparalleled journey. For 15 years because of the Miss Haiti pageant many young Haitian women got intimately connected to their Haitian roots.